In June, 2008 I went to Chicago and South Bend to plant flowers on Ann's grave and took a road trip up along the south shore of Lake Superior. The water was red that day because it had been raining a lot and it washed the iron ore into Lake Superior. 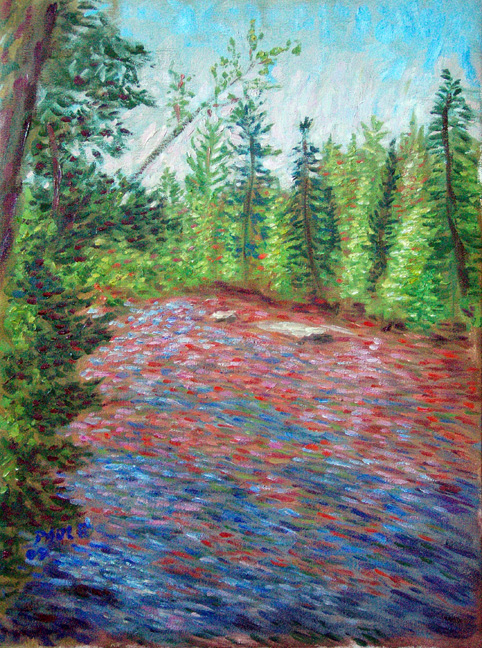 I found this tributary river, the Bois Brule that had a lot of the red ore in it and had to paint it. I love the contrast between the red and blue water and the background green trees on both sides of the river where it comes down out of the North Woods into the Lake. PaulB's Pointillistic/Impressionist original oil paintings of Lake Superior and various prints and poster formats of a wide variety of subject matter by the Pointillistic/Impressionist oil painter from landscape/waterscape paintings, dance, sports, portrait, to classical figures, flowers, rock and roll, Brazil, and Lake Superior paintings and prints are available for purchase for as little as $24.95 for an 8" x 10" matted print on photo pape. Pointillistic/Impressionist Giclee prints of Lake Superior on real canvas or heavy watercolor paper are available. One of a kind Lake Superior embellished prints, which are Giclee prints retouched in genuine oil paint by PaulB. Unless noted PaulB's original Pointillistic/Impressionist oil paintiings are oil on canvas. Paul Berenson's pointillistic/Impressionist oil paintings are in privale collections around the world, including the downtown Los Angeles Athletic Club and have appeared in numerous publications, including the New York Philharmonic Playbill. PaulB.com also builds websites and PaulB is a member of the LA Web Professionals Group.